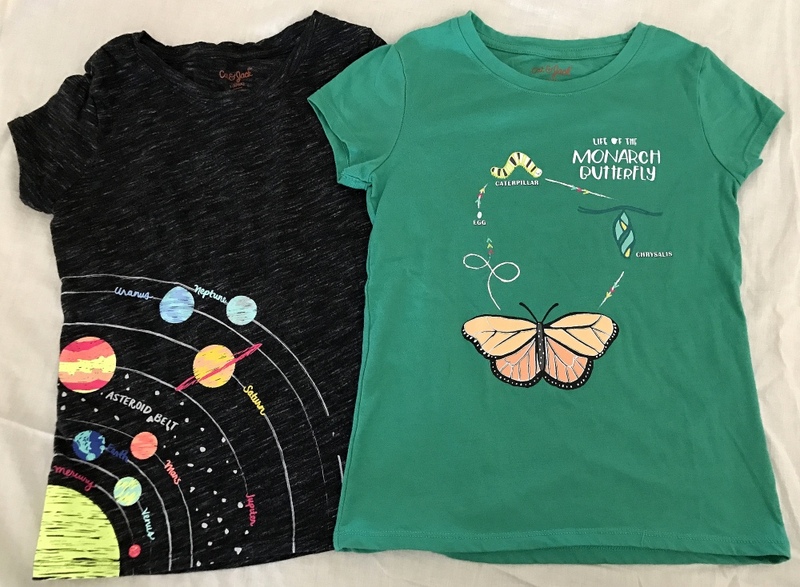 Dear Target: Thank you for including a wonderful range of science-related shirts in the girls’ department. This phrase runs through my mind whenever I peek into the girls’ clothing section during my weekly shopping trip. Seriously. Since Cat & Jack, Target’s new clothing line for kids, launched a little under a year ago, I’ve had way too much fun peeking through the various offerings to see what they could offer my little geekling. I’ve been happy with what I’ve found, because the graphic t-shirt offerings are so different than the rest of what’s available at other clothing stores. Finally, a niche has been filled in mainstream stores. Oh, but the shirt was green! Not pastel green, not mint, but GREEN. Also, the picture on the t-shirt? It’s of the life cycle of the monarch butterfly! This t-shirt has the egg, caterpillar, chrysalis, and fully grown butterfly on it, complete with a whimsical diagram to show how they’re all connected. That shirt was in my cart about 10 seconds after I spotted it. It would have been two seconds, but I needed to make sure I had the right size first. When I showed the new shirt to my daughter, she loved it (and I did present it in a neutral way). Then, after I explained what the shirt said, she thought it was awesome! It was barely warm enough for her to be allowed to wear it the next day, but she insisted (and agreed to take a sweatshirt to school in case she got cold). Other, similar shirts have been similar successes. The map of the solar system (on a black t-shirt, a color she generally does not allow in her wardrobe aside from leggings, but an exception was made) inspires a quick naming session of all the planets each time she puts it on. She hasn’t had a chance to wear the newest shirt I picked up, but now that we’re hitting warmer weather, I’m sure it will be pulled out any day now. 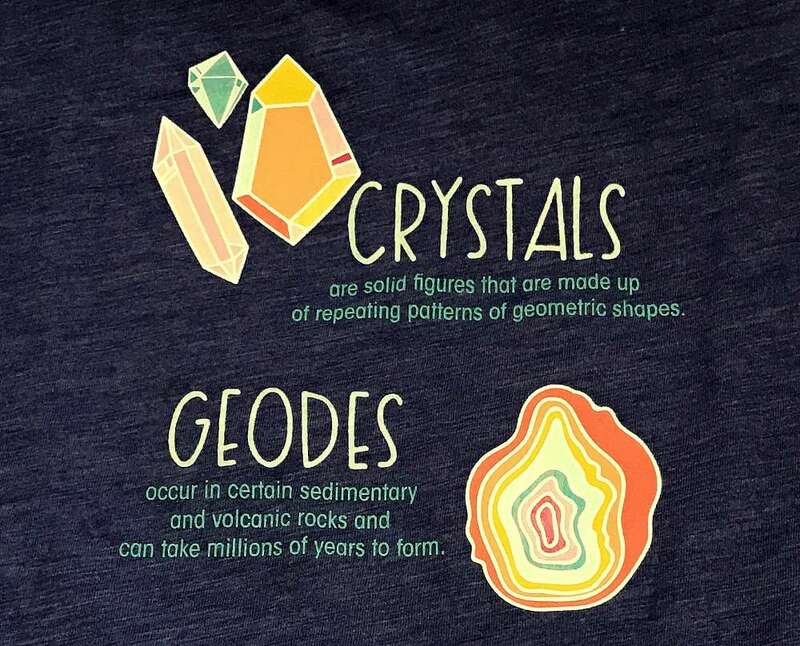 On the front, there’s an illustration of crystals and geodes (and sequins). On the back, there’s a short explanation as to how they differ. I’d talk about how my younger self is jealous, but that would require bringing up late 80s/early 90s fashion to compare, and bringing out that much florescent-colored clothing would likely violate a humanitarian treaty. So trust me, I’m jelly. Way jelly. At the same time, you shouldn’t be made to feel bad or less for liking things that sparkle. An enjoyment of glitter doesn’t preclude one from also being able to enjoy Star Wars. The desire to wear sequins doesn’t eliminate someone from liking geology. One value I hope I can instill in the core of my daughter is this: No one else gets to tell you what you enjoy. As one of her other favorite shirts says, “Hey girl, be you!” Being you, however, does get easier if you can find things that encompass all your interests in stores. And that is why these shirts are important. So, designers behind Cat & Jack, keep on being you, and more science-related shirts, please! Should I Bring My Child to a Convention? Oh, for cool! I wish my daughter was younger so I could get these for her! I might have to head to Target and pick some of these up anyway, to use as gifts or even donations, just to let Target know that they are on to something here! Thanks for posting, Rae. These are just the ones that are there right now – we’ve picked up others this past winter. I hope it’s a trend that continues!